Mamoun Sayah, general manager of Morocco's agricultural company Red Farm, is expecting to introduce his wines into the massive Chinese market through the first China International Import Expo (CIIE) scheduled for early November in Shanghai, a financial hub of China. "Our winery is expanding its production capacity" and used to produce 2.5 million bottles of wine each year, Sayah said, adding that his winery owns 300 hectares of grapes, 50 hectares of which will be harvested for the first time this year. Such a bumper harvest, which will help increase the wine production to 3 million bottles in 2018, has made Sayah turn his attention to the vast Chinese market to "digest the new capacity," especially less than one month ahead of the CIIE. "It is very attractive for us to participate in this event. At present, our wines are mainly sold domestically, and we hope to further open the export market," he explained. His Red Farm vineyard enjoys superior geographical conditions: 450 meters above sea level, backed by the valley, and adjacent to the Atlantic Ocean. This guaranteed the quality of the grapes and a French winemaker is also hired to guide wine production, said Sayah, in full confidence with his winery. At present, the winery boasts two wine filling production lines and has signed wine supply agreements with Moroccan high-end hotels. On the potential Chinese market, Sayah believes that with improving living standards, Chinese consumers' demand for Moroccan wine is rising. "Chinese consumers know very little about Moroccan wines. Therefore, Red Farm will adopt more modern and fashionable outer packaging and focus on marketing," he said. 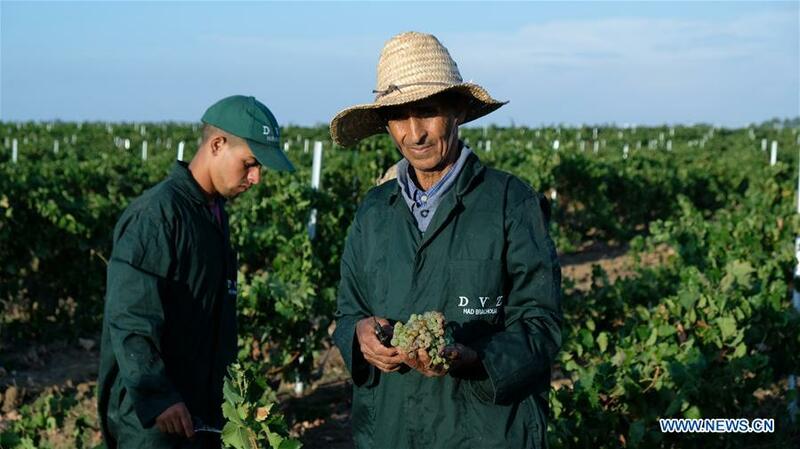 "I believe they can break through the encirclement of French wines and have a place in the Chinese market," the Moroccan wine producer noted. According to Sayah, his farm will focus on promoting its red, white and rose wines at the expo in Shanghai, and strive to open the Chinese market through wine tasting and on-site explanations. "Chinese consumers will find that the Red Farm wines are cost-effective and have a unique flavor. Our goal is to export 500,000 bottles of wine to China every year," he said. In addition to wine, the farm also produces 200,000 bottles of olive oil per year, and the import expo will be a good opportunity to expand the sales of olive oil, Sayah added. As of present, two Moroccan companies have decided to participate in the first China International Import Expo. Morocco's Secretary of State for Foreign Trade Rakiya Eddarhem said the presence of Moroccan companies at the expo contributes to the diversification of Morocco's economic partners and raises the popularity of Moroccan products. "The participation of Moroccan exporters in the major event is strategic for promoting Moroccan exports. The opening strategies, as well as the kingdom's African orientation, are beginning to bear fruit," said Hassan Sentissi El Idrissi, president of Moroccan Association of Exporters.